Choosing a group of three historical figures to attend a dinner with me is a difficult task (there have been millions of interesting people...or a couple dozen). People I admire are a must. I mean, inviting someone I would like to beat up, like Hitler, would be fun, but I like to think those people are getting their's in hell. So...here are the interesting people I admire that I think would make for fun conversation. He is only the favorite member of my favorite band and I never even had the chance to see him live. Aside from the fact that I am in awe of his artistic greatness, he was known to be very quick witted and sarcastic. I usually get along pretty well with those people because I am the same way. We could talk about politics too; I'm sure he gets tired of talking about music (well, if he were alive). Speaking of politics, I read a book about FDR and was amazed at his mental, physical and emotional strength. Not only did he have to deal with polio, he was president during maybe the second most difficult time in the nations history (probably the Civil War would be the most difficult). Despite having no real strength left in his legs due to polio, he worked out so much he could make it seem he could walk by holding onto a person's arm next to him. And election after election he won, through the Great Depression and led a war-weary country to war against Hitler. 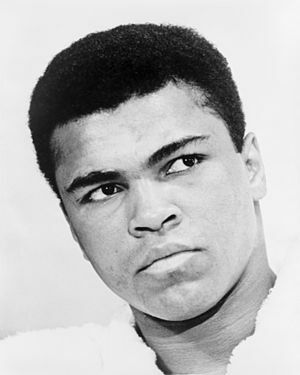 Ali would be the most intimidating to talk to because of his strong personality. I don't think even the strong personalities of Lennon or Roosevelt could compete against the former champ. He's the only one of this list that is still alive, but at my dinner he would be his young self from the 1960's, during the time when he had his belt stripped from him. His comedic ability, I think, would be fun to watch when paired up with Lennon and I would need someone to talk sports with, at least for a little while.